Boteh, ‘Seed of Life’. Caucasian Marasali Shirvan, 3ft 10in x 4ft 10in, late 19th century. OAKLAND, CA. – To many Westerners, the patterns of Near Eastern tribal rugs appear mysterious, even unfathomable. But these colorful geometrics are, in fact, windows to a venerable wisdom. Oral histories, passed down through countless generations of weavers, indicate that the motifs embody guidelines for embracing a harmonious posture toward life. Among the great nomadic tribal tribes of Persia and the Caucasus, the weaving of these hand-knotted art pieces was the sacred activity of women. Since time immemorial, in small isolated encampments far from the workshops of Persian cities, grandmothers, wives and daughters — often from the age of five or six — worked on small portable looms. Husband and sons did their share by shearing the fat-tailed sheep and dyeing the yarns. New projects often commenced on an auspicious occasion, such as the birth of a child, but only after special prayers were said for the protection and well being of the weaver’s clan. Rugs already in progress were often resumed the day after a birth, as if to incorporate the spirit of the new being into the matrix of design. In contrast, no weaving was done during periods of mourning. In this way, death was honored and time was taken to digest the experience of loss. Motifs, often inspired by nature, were passed down from generation to generation. Today, in the 21st century, these patterns remain compelling, ageless. Their enduring gravitas stems from the fact that the majority of them, far from being merely decorative, embody attributes their creators deemed essential to a life well lived. The almond-shaped boteh, for example, an agricultural symbol known by tribal peoples as the “Seed of Life,” may have originally represented a cypress tree before it was taken up as the decorative “paisley” in India. On a deeper level, it symbolizes abundance, the idea that anything taking root in the right kind of soil can grow and thrive. Some weavers’ descendants we’ve spoken with take the metaphor a step farther. The boteh, they say, represents the interconnectedness of life, the idea that everything in the universe stems from a common seed. 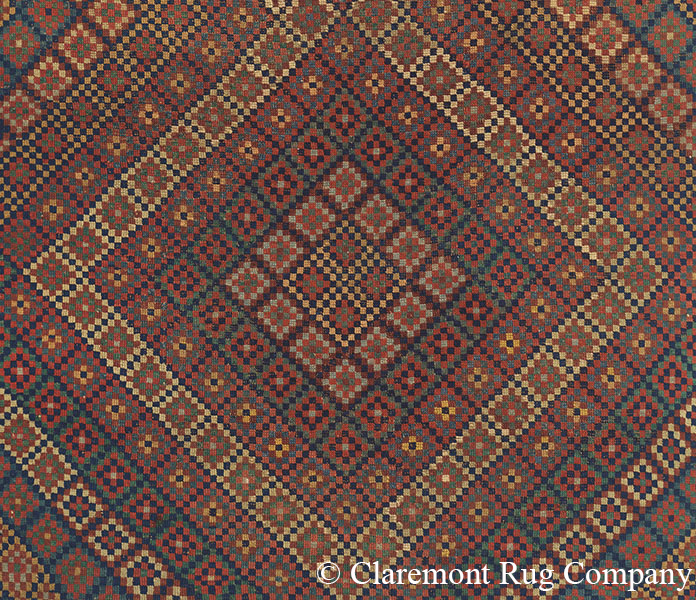 The rainbow-hued ‘Diamonds of Strength,’ which sometimes appears as a medallion within a rug’s field, other times as a protective border or “guard,” serves a similar purpose. It symbolizes the resources that reside deep within each of us; the fortitude and persistence that allow us to weather life’s difficulties, as well as to appreciate life’s joys. 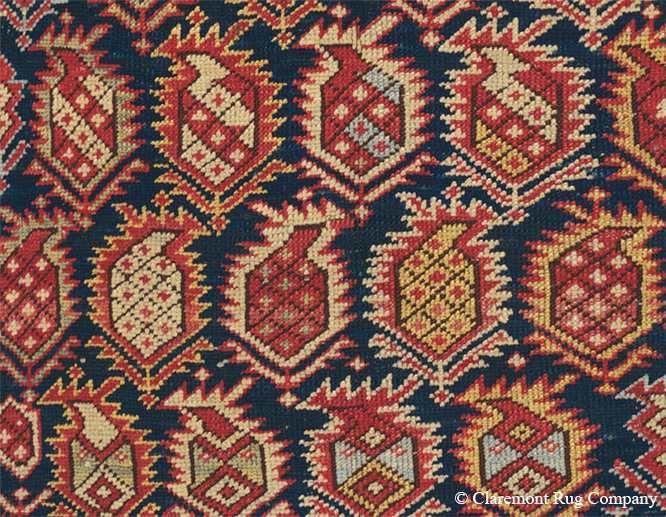 In the 1960s, a Caucasus-region weaver related the following story to anthropologists: An elderly man, a resident of the rugged Caucasus Mountains, sets off at a trot every morning on the steep and rugged half-mile climb down to the river. Frigid water pours from the icy glaciers overhead. At the waters’ edge, he strips and wades out into the stream. After bathing for some time, he dries himself off, puts on his clothes, and climbs swiftly back up the rugged slope. He is 104 years old. His rigorous daily challenge is the key to both his vitality and longevity. Perhaps the multifaceted diamond motif in a particular Caucasian rug was placed there to represent the weaver’s own venerable grandfather. Or perhaps ‘Diamonds of Strength’ motif was placed there in the hopes that she herself would embody these virtues throughout her own life. The boteh, the diamonds, and numerous other patterns signify wisdom that does not “date” with the passage of time. Though most of us live complex and technological lives that would appear unfathomable to the ancient Caucasian mountain dwellers, the gift of their knowledge and insights remains as relevant today as when the weaver’s ancient flocks foraged, before their wool was even carded and dyed, their looms threaded. Their craftsmanship serves to elevate us from feeling set apart, encouraging us to be more alive and excited about the world we inhabit. One might even think of these weavings as nonverbal texts that transcend specific languages, cultures and eras. It’s not uncommon for clients to tell us that taking a few moments in the morning to contemplate one of their tribal rugs energizes them for the day. These tribal rugs are nothing less than a legacy passed down, woven gifts created by people who inhabited often spartan geographies very distant from our own, and whose lives were shaped by cultures otherwise lost to history. Put another way, they are irreplaceable cultural artifacts that enrich both our homes and our overall quality of life. As with all great works of art, we can pride ourselves on being entrusted with their care for future generations.